Learn how to be a face painter. 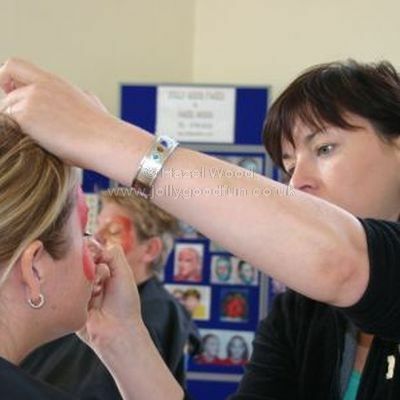 Comprehensive two day face painting course gives thorough training on materials, equipment and the skills required to become a professional face painter. The course is run by Hazel Wood and takes place in Richmond, North Yorkshire. This course is for people who want proper training in the art of face painting. If you value high standards and you want to learn everything you need to know in order to offer your customers a first class service then this course is for you. 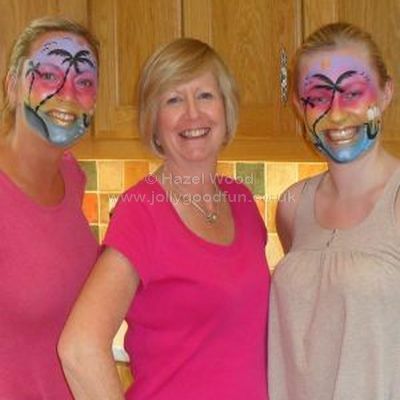 Course Tutor Hazel has been working in the Face Painting Business for over twenty years. She is highly respected by other established Face Painting Professionals and has herself received training from many of the world's most renowned face painting exponents. As well as being a great teacher Hazel is also friendly and approachable. She will always do her best for you. There is a lot to learn, it's hard work but it's also great fun! The course provides comprehensive knowledge on all aspects of face painting together with expert instruction on techniques and practical matters. Find out the pros and cons of different types of equipment to help you choose what is right for you. Compare a variety of different products. Learn how they vary and try them out. Find out which ones you like and how you might prefer one to another when you are working. We also cover the important administrative side of the business. Heath, Safety and Hygiene are extremely important. Some things are obvious but others are not so. You need to be fully aware of your responsibilities when providing a professional service. How to apply a base colour evenly and blending several colours together. Practical training on the correct use of sponges for various applications. Good brush work is vital for putting in outlines and detail. Learn how to use your brushes properly. To produce stunning faces you need to master the techniques of blending. Step by step instruction on painting a selection of basic faces. Be inspired by looking through our library of Face Painting books and magazines. You are also welcome to watch our Face Painting DVDs at break times or over lunch if you wish. Find out about FACE and how to join. All of the materials and equipment you require is provided for you. We give you "hand outs" / information sheets to take away. You will be working in comfortable surroundings. There is FREE tea, coffee, soft drinks and biscuits. If you are travelling by train we will collect you from Darlington Railway Station. A camera to record your work. A packed lunch ( or you can go into Richmond to buy lunch ). Contact Hazel by email, hazel@jollygoodfun.co.uk or telephone 01748 821621, to check that the course is going ahead and that a place is available. Send a £80 non refundable deposit either by cheque or Paypal to secure your place. The balance is paid on arrival on the first day of the course. When we receive your deposit we will send you a receipt plus joining instructions with course information and directions. Trainees take turns painting each others faces. Tranee takes care painting near eyes. Hazel observes a student applying face paint.